Hellboy is coming back and from everything we know so far it's looking looking really dark, very bloody, and bit less campy than Guillermo Del Toro's take on the indie comic favorite. Also, no Ron Perlman, which is sad, but judging from this first look of actor David Harbour as Helloboy he wouldn't have fit into the look all that much anyway. 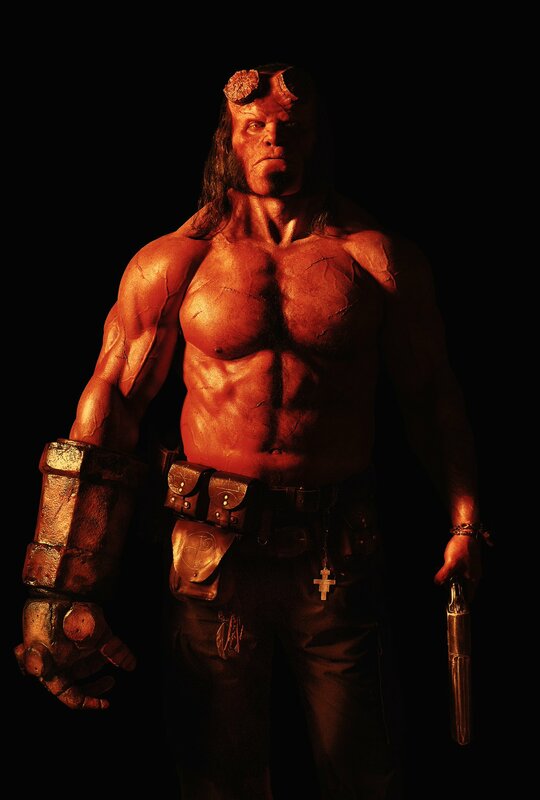 Yea, Hellboy is really jacked and shirtless. I mean most of that is prosthetic and makeup, but I think Harbour is going to pull off this take really well from this look. The movie has Mike Mignola, Hellboy's creator, advising on the screenplay so it should be pretty in line with the source material, and with The Descent director Neill Marshall helming I'm guessing we will be getting a much scarier take on the entire world of Hellboy. It'll be a reboot, so this isn't connected at all to the other two films, but it's also not an origin story so maybe we'll be able to head-cannon it all together somehow. That's all good for me. Del Toro had a great vision for his films, but I think something different and scarier will make for a fantastic Hellboy as well. Of course one-liners and humor better show up too. So what do we think of the ol' hornless wonder (I don't know any Hellboy nicknames...)?